This article is about the causes and analysis of the relatively high oil prices of the 2000s. For a chronology of oil prices during this time, see World oil market chronology from 2003. For a time, geopolitical events and natural disasters had strong short-term effects on oil prices, such as North Korean missile tests, the 2006 conflict between Israel and Lebanon, worries over Iranian nuclear plans in 2006, Hurricane Katrina, and various other factors. By 2008, such pressures appeared to have an insignificant impact on oil prices given the onset of the global recession. The recession caused demand for energy to shrink in late 2008, with oil prices collapsing from the July 2008 high of $147 to a December 2008 low of $32. However, it has been disputed that the laws of supply and demand of oil could have been responsible for an almost 80% drop in the oil price within a 6 month period. Oil prices stabilized by August 2009 and generally remained in a broad trading range between $70 and $120 through November 2014, before returning to 2003 pre-crisis levels by early 2016. 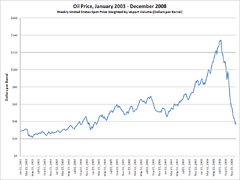 The price of crude oil in 2003 traded in a range between $20–$30/bbl. Between 2003 and July 2008, prices steadily rose, reaching $100/bbl in late 2007, coming close to the previous inflation-adjusted peak set in 1980. [better source needed] A steep rise in the price of oil in 2008 – also mirrored by other commodities – culminated in an all-time high of $147.27 during trading on 11 July 2008, more than a third above the previous inflation-adjusted high. High oil prices and economic weakness contributed to a demand contraction in 2007–2008. In the United States, gasoline consumption declined by 0.4% in 2007, then fell by 0.5% in the first two months of 2008 alone. Record-setting oil prices in the first half of 2008 and economic weakness in the second half of the year prompted a 1.2 Mbbl (190,000 m3)/day contraction in US consumption of petroleum products, representing 5.8% of total US consumption, the largest annual decline since 1980 at the climax of the 1979 energy crisis. Transportation consumes the largest proportion of energy, and has seen the largest growth in demand in recent decades. This growth has largely come from new demand for cars and other personal-use vehicles powered by internal combustion engines. This sector also has the highest consumption rates, accounting for approximately 55% of oil use worldwide as documented in the Hirsch report and 68.9% of the oil used in the United States in 2006. Cars and trucks are predicted to cause almost 75% of the increase in oil consumption by India and China between 2001 and 2025. In 2008, auto sales in China were expected to grow by as much as 15–20 percent, resulting in part from economic growth rates of over 10 percent for five years in a row. Demand growth is highest in the developing world, but the United States is the world's largest consumer of petroleum. Between 1995 and 2005, US consumption grew from 17.7 million barrels (2,810,000 m3) a day to 20.7 million barrels (3,290,000 m3) a day, an increase of 3 million barrels (480,000 m3) a day. China, by comparison, increased consumption from 3.4 million barrels (540,000 m3) a day to 7 million barrels (1,100,000 m3) a day, an increase of 3.6 million barrels (570,000 m3) a day, in the same time frame. Per capita, annual consumption is 24.85 barrels (3.951 m3) by people in the US, 1.79 barrels (0.285 m3) in China, and 0.79 barrels (0.126 m3) in India. Although swift continued growth in China is often predicted, others predict that China's export-dominated economy will not continue such growth trends due to wage and price inflation and reduced demand from the US. India's oil imports are expected to more than triple from 2005 levels by 2020, rising to 5 million barrels per day (790×10^3 m3/d). State fuel subsidies shielded consumers in many nations from higher market prices, but many of these subsidies were reduced or removed as the governmental cost rose. China became the latest Asian nation to curb energy subsidies last week after hiking retail petrol and diesel prices as much as 18 percent... Elsewhere in Asia, Malaysia has hiked fuel prices by 41 percent and Indonesia by around 29 percent, while Taiwan and India have also raised their energy costs. Countries like China and India, along with Gulf nations whose retail oil prices are kept below global prices, contributed 61 percent of the increase in global consumption of crude oil from 2000 to 2006, according to JPMorgan. The Economist reported: "Half of the world's population enjoys fuel subsidies. This estimate, from Morgan Stanley, implies that almost a quarter of the world's petrol is sold at less than the market price." U.S. Secretary of Energy Samuel Bodman stated that around 30 million barrels per day (4,800,000 m3/d) of oil consumption (over a third of the global total) was subsidized. An important contributor to the price increase was the slowdown in oil supply growth, which has been a general trend since oil production surpassed new discoveries in 1980. The likelihood that global oil production will decline at some point, leading to lower supply, is a long-term fundamental cause of rising prices. Although there is contention about the exact time at which global production will peak, a majority of industry participants acknowledge that the concept of a production peak is valid. However, some commentators argued that global warming awareness and new energy sources would limit demand before the effects of supply could, suggesting that reserve depletion would be a non-issue. A large factor in the lower supply growth of petroleum has been that oil's historically high ratio of Energy Returned on Energy Invested is in significant decline. Petroleum is a limited resource, and the remaining accessible reserves are consumed more rapidly each year. Remaining reserves are increasingly difficult to extract and therefore more expensive. Eventually, reserves will only be economically feasible to extract at extremely high prices. Even if total oil supply does not decline, increasing numbers of experts[who?] believe the easily accessible sources of light sweet crude are almost exhausted and in the future the world will depend on more-expensive unconventional oil reserves and heavy crude oil, as well as renewable energy sources. It is thought by many, including energy economists such as Matthew Simmons, that prices could continue to rise indefinitely until a new market equilibrium is reached at which point supply satisfies worldwide demand. Timothy Kailing, in a 2008 Journal of Energy Security article, pointed out the difficulty of increasing production in mature petroleum regions, even with vastly increased investment in exploration and production. By looking at the historical response of production to variation in drilling effort, he claimed that very little increase of production could be attributed to increased drilling. This was due to a tight quantitative relationship of diminishing returns with increasing drilling effort: As drilling effort increased, the energy obtained per active drill rig was reduced according to a severely diminishing power law. This analysis suggested that even an enormous increase of drilling effort was unlikely to lead to significantly increased oil and gas production in a mature petroleum region like the United States. A prominent example of investment in non-conventional sources is seen in the Canadian oil sands. They are a far less cost-efficient source of heavy, low-grade oil than conventional crude; but when oil trades above $60/bbl, the tar sands become attractive to exploration and production companies. While Canada's oil sands region is estimated to contain as much "heavy" oil as all the world's reserves of "conventional" oil, efforts to economically exploit these resources lag behind the increasing demand of recent years. Until 2008, CERA (a consulting company wholly owned by energy consultants IHS Energy) did not believe this would be such an immediate problem. However, in an interview with The Wall Street Journal, Daniel Yergin, previously known for his quotes that the price of oil would soon return down to "normal", amended the company's position on 7 May 2008 to predict that oil would reach $150 during 2008, due to tightness of supply. This reversal of opinion was significant, as CERA, among other consultancies, provided price projections that were used by many official bodies to plan long-term strategy in respect of energy mix and price. Other major energy organisations, such as the International Energy Agency (IEA), had already been much less optimistic in their assessments for some time. In 2008, the IEA drastically accelerated its prediction of production decline for existing oilfields, from 3.7% a year to 6.7% a year, based largely on better accounting methods, including actual research of individual oil field production throughout the world. Terrorist and insurgent groups have increasingly targeted oil and gas installations, and succeeded in stopping a substantial volume of exports during the 2003–2008 height of the American occupation of Iraq. Such attacks are sometimes perpetrated by militias in regions where oil wealth has produced few tangible benefits for the local citizenry, as is the case in the Niger Delta. Several claims have been made implicating financial speculation as a major cause of the price increases. In May 2008 the transport chief for Germany's Social Democrats estimated that 25 percent of the rise to $135 a barrel had nothing to do with underlying supply and demand. Testimony was given to a U.S. Senate committee in May indicating that "demand shock" from "institutional investors" had increased by 848 million barrels (134,800,000 m3) over the previous five years, almost as much as the increased physical demand from China (920 million barrels (146,000,000 m3)). The influence of institutional investors, such as sovereign wealth funds, was also discussed in June 2008, when Lehman Brothers suggested that price increases were related to increases in exposure to commodities by such investors. It claimed that "for every $100 million in new inflows, the price of West Texas Intermediate, the U.S. benchmark, increased by 1.6%." Also in May 2008, an article in The Economist pointed out that oil futures transactions on the New York Mercantile Exchange (NYMEX), nearly mirrored the price of oil increases for a several-year period; however, the article conceded that the increased investment might be following rising prices, rather than causing them, and that the nickel commodity market had halved in value between May 2007 and May 2008 despite significant speculative interest. It also reminded readers that "Investment can flood into the oil market without driving up prices because speculators are not buying any actual crude... no oil is hoarded or somehow kept off the market," and that prices of some commodities which are not openly traded have actually risen faster than oil prices. In June 2008, OPEC's Secretary General Abdallah Salem el-Badri stated that current world consumption of oil at 87 million bpd was far exceeded by the "paper market" for oil, which equaled about 1.36 billion bpd, or more than 15 times the actual market demand. An interagency task force on commodities markets was formed in the U.S. government to investigate the claims of speculators' influence on the petroleum market. The task force concluded in July 2008 that "market fundamentals" such as supply and demand provided the best explanations for oil price increases, and that increased speculation was not statistically correlated with the increases. The report also noted that increased prices with an elastic supply would cause increases in petroleum inventories. As inventories actually declined, the task force concluded that market pressures were most likely to blame. Other commodities that were not subject to market speculation (such as coal, steel, and onions) saw similar price increases over the same time period. In June 2008 U.S. energy secretary Samuel Bodman said that insufficient oil production, not financial speculation, was driving rising crude prices. He said that oil production had not kept pace with growing demand. "In the absence of any additional crude supply, for every 1% of crude demand, we will expect a 20% increase in price in order to balance the market," Bodman said. This contradicted earlier statements by Iranian OPEC governor Mohammad-Ali Khatibi indicating that the oil market was saturated and that an increase in production announced by Saudi Arabia was "wrong". OPEC itself had also previously stated that the oil market was well supplied and that high prices were a result of speculation and a weak U.S. dollar. In September 2008, Masters Capital Management released a study of the oil market, concluding that speculation did significantly impact the price. The study stated that over $60 billion was invested in oil during the first six months of 2008, helping drive the price per barrel from $95 to $147, and that by the beginning of September, $39 billion had been withdrawn by speculators, causing prices to fall. There is debate over what the effects of the 2000s energy crisis will be over the long term. Some speculated that an oil-price spike could create a recession comparable to those that followed the 1973 and 1979 energy crises or a potentially worse situation such as a global oil crash. Increased petroleum prices are reflected in a vast number of products derived from petroleum, as well as those transported using petroleum fuels. In addition to high oil prices, from year 2000 volatility in the price of oil has increased notably and this volatility has been suggested to be a factor in the financial crisis which began in 2008. In the same period, the Euro gained value over the U.S. dollar to make oil in the Eurozone 2.94 times more expensive. On average, oil prices roughly quadrupled for these areas, triggering widespread protest activities. A similar price surge for petroleum-based fertilizers contributed to the 2007–08 world food price crisis and further unrest. In 2008, a report by Cambridge Energy Research Associates stated that 2007 had been the year of peak gasoline usage in the United States, and that record energy prices would cause an "enduring shift" in energy consumption practices. According to the report, in April gas consumption had been lower than a year before for the sixth straight month, suggesting 2008 would be the first year U.S. gasoline usage declined in 17 years. The total miles driven in the U.S. began declining in 2006. In the United States, oil prices contributed to inflation averaging 3.3% in 2005–2006, significantly above the average of 2.5% in the preceding 10-year period. As a result, during this period the Federal Reserve steadily raised interest rates to curb inflation. High oil prices typically affect less-affluent countries first, particularly the developing world with less discretionary income. There are fewer vehicles per capita, and oil is often used for electricity generation as well as private transport. The World Bank has looked more deeply at the effect of oil prices in the developing countries. One analysis found that in South Africa a 125 percent increase in the price of crude oil and refined petroleum reduces employment and GDP by approximately 2 percent, and reduces household consumption by approximately 7 percent, affecting mainly the poor. OPEC's annual oil export revenue surged to a new record in 2008, estimated around US$800 billion. According to informed observers, OPEC, meeting in early December 2007, seemed to desire a high but stable price that would deliver substantial needed income to the oil-producing states, but avoid prices so high that they would negatively impact the economies of the oil-consuming nations. A range of US$70–80 per barrel was suggested by some analysts to be OPEC's goal. In November 2008, as prices fell below $60 a barrel, the IEA warned that falling prices could lead to both a lack of investment in new sources of oil and a fall in production of more-expensive unconventional reserves such as the oil sands of Canada. The IEA's chief economist warned, "Oil supplies in the future will come more and more from smaller and more-difficult fields," meaning that future production requires more investment every year. A lack of new investment in such projects, which had already been observed, could eventually cause new and more-severe supply issues than had been experienced in the early 2000s according to the IEA. Because the sharpest production declines had been seen in developed countries, the IEA warned that the greatest growth in production was expected to come from smaller projects in OPEC states, raising their world production share from 44% in 2008 to a projected 51% in 2030. The IEA also pointed out that demand from the developed world may have also peaked, so that future demand growth was likely to come from developing nations such as China, contributing 43%, and India and the Middle East, each about 20%. By the beginning of September 2008, prices had fallen to $110. OPEC Secretary General El-Badri said that the organization intended to cut output by about 500,000 barrels (79,000 m3) a day, which he saw as correcting a "huge oversupply" due to declining economies and a stronger U.S. dollar. On 10 September, the International Energy Agency (IEA) lowered its 2009 demand forecast by 140,000 barrels (22,000 m3) to 87.6 million barrels (13,930,000 m3) a day. As many countries throughout the world entered an economic recession in the third quarter of 2008 and the global banking system came under severe strain, oil prices continued to slide. In November and December, global demand growth fell, and U.S. oil demand fell an estimated 10% overall from early October to early November 2008 (accompanying a significant drop in auto sales). In their December meeting, OPEC members agreed to reduce their production by 2.2 million barrels (350,000 m3) per day, and said their resolution to reduce production in October had an 85% compliance rate. Petroleum prices fell below $35 in February 2009, but by May 2009 had risen back to mid-November 2008 levels around $55. The global economic downturn left oil-storage facilities with more oil than in any year since 1990, when Iraq's invasion of Kuwait upset the market. In early 2011, crude oil rebounded above US$100/bbl due to the Arab Spring protests in the Middle East and North Africa, including the 2011 Egyptian revolution, the 2011 Libyan civil war, and steadily tightening international sanctions against Iran. The oil price fluctuated around $100 through early 2014. By 2014–2015, the world oil market was again steadily oversupplied, led by an unexpected near-doubling in U.S. oil production from 2008 levels due to substantial improvements in shale "fracking" technology. By January 2016, the OPEC Reference Basket fell to US$22.48/bbl – less than one-sixth of its record from July 2008 ($140.73), and back below the April 2003 starting point ($23.27) of its historic run-up. OPEC production was poised to rise further with the lifting of Iranian sanctions, at a time when markets already appeared to be oversupplied by at least 2 million barrels per day. Economists say that the substitution effect will spur demand for alternate fossil fuels, such as coal or liquefied natural gas and for renewable energy, such as solar power, wind power, and advanced biofuels. The rise in oil prices caused renewed interest in electric cars, with several new models hitting the market, both hybrid and purely electric. The most successful among the former being the Toyota Prius and among the latter the cars of companies like Tesla. Several countries also incentivized the use of electric cars through tax-breaks or subsidies or by building charging stations. In a similar vein as the original TGV that was switched from gas turbine to electric propulsion after the 1973 oil crisis, several countries have renewed and increased their efforts for electric propulsion in their rail systems, specifically High-speed rail. In the time since 2003, the global High speed rail network almost doubled and there are plans globally that amount to the network being doubled again within the next ten to twenty years, based on current constructions. China in particular went from having no High speed rail whatsoever in 2003 to the longest network in the world in 2015. France, Italy, and the Netherlands lowered taxes in 2000 in response to protests over high prices, but other European nations resisted this option because public service finance is partly based on energy taxes. The issue came up again in 2004, when oil reached $40 a barrel causing a meeting of 25 EU finance ministers to lower economic growth forecasts for that year. Because of budget deficits in several countries, they decided to pressure OPEC to lower prices instead of lowering taxes. In 2007, European truckers, farmers, and fishermen again raised concerns over record oil prices cutting into their earnings, hoping to have taxes lowered. In the United Kingdom, where fuel taxes were raised in October and were scheduled to rise again in April 2008, there was talk of protests and roadblocks if the tax issue was not addressed. On 1 April 2008, a 25 yen per liter fuel tax in Japan was allowed to lapse temporarily. Locally decreasing fuel tax can decrease fuel prices, but globally prices are set by supply and demand, and therefore fuel tax decreases may have no effect on fuel prices, and fuel tax increases might actually decrease fuel prices by reducing demand. But this depends on the price elasticity of demand for fuel which is -0.09 to -0.31, meaning that fuel is a relatively inelastic commodity, i.e. increasing or decreasing prices have overall only a small effect on demand and therefore price change. For individuals, telecommuting provides alternatives to daily commuting and long-distance air travel for business. Technologies for telecommuting, such as videoconferencing, e-mail, and corporate wikis, continue to improve, in keeping with the overall improvement in information technologies ascribed to Moore's law. As the cost of moving human workers continues to rise, while the cost of moving information electronically continues to fall, presumably market forces should cause more people to substitute virtual travel for physical travel. Matthew Simmons explicitly calls for "liberating the workforce" by changing the corporate mindset from paying people to show up physically to work every day, to paying them instead for the work they do, from any location. This would allow many more information workers to work from home either part-time or full-time, or from satellite offices or Internet cafes near to where they live, freeing them from long daily commutes to central offices. However, even full adoption of telecommuting by all eligible workers might only decrease energy consumption by about 1% (with present energy savings estimated at 0.01–0.04%). By comparison, a 20% increase in automobile fuel economy would save 5.4%. On 26 July 2008, the United States House of Representatives passed the Energy Markets Emergency Act of 2008 (H.R. 6377), which directs the Commodity Futures Trading Commission (CFTC) "to utilize all its authority, including its emergency powers, to curb immediately the role of excessive speculation in any contract market within the jurisdiction and control of the Commodity Futures Trading Commission, on or through which energy futures or swaps are traded, and to eliminate excessive speculation, price distortion, sudden or unreasonable fluctuations or unwarranted changes in prices, or other unlawful activity causing major market disturbances that prevent the market from accurately reflecting the forces of supply and demand for energy commodities." ^ "Crude Oil EmiNY Weekly Commodity Futures Price Chart : NYMEX". tfc-charts.com. Archived from the original on 2 May 2014. Retrieved 1 May 2018. ^ a b Oil price 'may hit $200 a barrel' Archived 11 April 2009 at the Wayback Machine, BBC News, 7 May 2008. ^ "US Markets-Oil". Reuters. Retrieved 27 December 2008. ^ "Record oil price sets the scene for $200 next year". AME. 6 July 2006. Archived from the original on 14 December 2007. Retrieved 29 November 2007. ^ "Peak Oil News Clearinghouse". EnergyBulletin.net. Archived from the original on 17 December 2008. Retrieved 27 December 2008. ^ "The Hike in Oil Prices: Speculation – But Not Manipulation". Archived from the original on 18 May 2012. Retrieved 27 December 2008. ^ "Missile tension sends oil surging". CNN. Archived from the original on 24 December 2009. Retrieved 21 April 2010. ^ "Oil hits $100 barrel". BBC News. 2 January 2008. Archived from the original on 13 December 2009. Retrieved 31 December 2009. ^ "Iran nuclear fears fuel oil price". BBC News. 6 February 2006. Archived from the original on 9 January 2010. Retrieved 31 December 2009. ^ "We're sorry, that page can't be found" (PDF). fpc.state.gov. 6 February 2017. Archived (PDF) from the original on 15 March 2018. Retrieved 1 May 2018. ^ "The Times & The Sunday Times". thetimes.co.uk. Retrieved 1 May 2018. ^ Gross, Daniel (5 January 2008). "Gas Bubble: Oil is at $100 per barrel. Get used to it". Slate. Archived from the original on 17 October 2008. Retrieved 27 December 2008. ^ "Oil Prices Fall As Gustav Hits". Sky News. 2 September 2008. Archived from the original on 22 June 2009. Retrieved 5 May 2009. ^ Tuttle, Robert; Galal, Ola (10 May 2010). "Oil Ministers See Demand Rising, Price May Exceed $85". Bloomberg News. Archived from the original on 6 February 2016. Retrieved 14 January 2016. ^ "Leaked Documents Reveal Major Speculators Behind 2008 Oil Price Shock: Hedge Funds, Koch, Big Banks, Oil Companies". Retrieved 25 August 2018. ^ "Weekly United States Spot Price FOB Weighted by Estimated Import Volume". U.S. Energy Information Administration. February 2009. Archived from the original on 14 May 2009. Retrieved 13 February 2009. ^ "What is driving oil prices so high?". BBC. 5 November 2007. Archived from the original on 11 April 2009. Retrieved 31 December 2009. ^ Read, Madlen (11 July 2008). "Oil sets new trading record above $147 a barrel". USA Today. Archived from the original on 18 March 2009. Retrieved 13 February 2009. ^ Marianne Lavelle (4 March 2008). "Oil Demand Is Dropping, but Prices Aren't". U.S. News & World Report. Archived from the original on 12 October 2008. Retrieved 27 December 2008. ^ Frank Langfitt (5 March 2008). "Americans Using Less Gasoline". NPR. Archived from the original on 14 May 2009. Retrieved 7 May 2009. ^ "Short-Term Energy Outlook" (PDF). U.S. Energy Information Administration. 10 February 2009. Archived (PDF) from the original on 14 May 2009. Retrieved 1 January 2016. ^ "Global Oil Consumption". U.S. Energy Information Administration. Archived from the original on 27 July 2008. Retrieved 27 July 2008. ^ "World oil demand 'to rise by 37%'". BBC News. 20 June 2006. Archived from the original on 20 April 2009. Retrieved 31 December 2009. ^ "2007 International Energy Outlook: Petroleum and other liquid fuels". U.S. Energy Information Administration. May 2007. Archived from the original on 4 April 2009. Retrieved 27 December 2008. ^ Clifford Krauss (2 July 2008). "Oil Demand Will Grow, Despite Prices, Report Says". The New York Times. Archived from the original on 24 April 2009. Retrieved 3 July 2008. ^ Wood John H, Long Gary R, Morehouse David F (18 August 2004). "Long-Term World Oil Supply Scenarios: The Future Is Neither as Bleak or Rosy as Some Assert". Energy Information Administration. Archived from the original on 4 August 2008. Retrieved 27 July 2008. ^ "Domestic Demand for Refined Petroleum Products by Sector". U.S. Bureau of Transportation Statistics. Archived from the original on 29 September 2007. Retrieved 20 December 2007. ^ "Asia's Thirst for Oil". Wall Street Journal. 5 May 2004. Archived from the original on 24 December 2008. Retrieved 27 December 2008. ^ Joe Mcdonald (21 April 2008). "Gas guzzlers a hit in China, where car sales are booming". Associated Press. Retrieved 27 December 2008. ^ a b "International Petroleum (Oil) Consumption Data". U.S. Energy Information Administration. Archived from the original on 12 December 2007. Retrieved 20 December 2007. ^ "BP Statistical Review of Energy – 2008". Beyond Petroleum. 2008. Archived from the original on 27 July 2008. Retrieved 27 July 2008. ^ Kevin O'Brien (2 July 2008). "China's Negative Economic Outlook". Seeking Alpha. Archived from the original on 4 August 2008. Retrieved 27 July 2008. ^ "China and India: A Rage for Oil". Business Week. 25 August 2005. Archived from the original on 25 October 2008. Retrieved 27 July 2008. ^ Duncan Richard C (November 2001). "The Peak of World Oil Production and the Road to the Olduvai Gorge". Population & Environment. 22 (5): 503–522. doi:10.1023/A:1010793021451. ISSN 1573-7810. Archived from the original on 24 June 2009. Retrieved 27 December 2008. ^ "Total Midyear Population for the World: 1950–2050". U.S. Census Bureau. Archived from the original on 15 December 2007. Retrieved 20 December 2007. ^ a b "Chinese cut fuel subsidies but demand fears remain". AFP. 22 June 2008. Retrieved 1 January 2016. ^ "The hidden costs of fuel subsidies". Reuters. Archived from the original on 10 July 2008. Retrieved 10 July 2008. ^ "Crude measures". The Economist. 29 May 2008. Archived from the original on 11 July 2008. Retrieved 10 July 2008. ^ "Peak Oil Primer - Resilience". www.energybulletin.net. Archived from the original on 1 February 2013. Retrieved 1 May 2018. ^ Peter Davies, Economist for BP (14 June 2007). "World oil supplies are set to run out faster than expected, warn scientists". The Independent. UK. Archived from the original on 8 September 2016. We don't believe there is an absolute resource constraint. When peak oil comes, it is just as likely to come from consumption peaking, perhaps because of climate change policies as from production peaking. ^ Kailing, Timothy D. (December 2008). "Can the United States Drill Its Way to Energy Security?". Journal of Energy Security. Archived from the original on 23 June 2009. Retrieved 27 December 2008. ^ "Canada: Pinning hopes on the tar sand". EnergyBulletin.net. Archived from the original on 6 January 2009. Retrieved 27 December 2008. ^ "IHS Energy Acquires Cambridge Energy Research Associates (CERA)". 1 September 2004. Archived from the original on 24 December 2007. Retrieved 30 November 2007. ^ Neil King Jr; Spencer Swartz (7 May 2008). "Some See Oil At $150 a Barrel This Year". Wall Street Journal. Archived from the original on 8 January 2009. Retrieved 27 December 2008. ^ "Transcript: Interview with IEA chief economist". Financial Times. Archived from the original on 19 June 2009. Retrieved 27 December 2008. Interview with Fatih Birol. ^ Simmons, Greg (7 December 2005). "Dems Doubt Iraq Progress". Fox News. Archived from the original on 13 January 2007. Retrieved 2 January 2016. ^ "Oil price 'may hit $200 a barrel'". BBC News. 7 May 2008. Archived from the original on 11 April 2009. ^ a b "Double, double, oil and trouble". The Economist. 29 May 2008. Archived from the original on 12 June 2008. Retrieved 17 June 2008. ^ Evans-Pritchard, Ambrose (26 May 2008). "Germany in call for ban on oil speculation". The Daily Telegraph. London: The Telegraph. Archived from the original on 5 June 2008. Retrieved 7 June 2008. ^ Masters, Michael (20 May 2008). "Written Testimony" (PDF). United States Senate Committee on Homeland Security and Governmental Affairs. Archived (PDF) from the original on 28 May 2008. Retrieved 28 May 2008. ^ Chazan, Guy; Neil King Jr. (4 June 2008). "Is Oil the Next 'Bubble' to Pop?". Wall Street Journal. Archived from the original on 8 March 2016. Retrieved 17 June 2008. ^ "OPEC chief appeals for calm over oil". Reuters. 10 June 2008. Archived from the original on 9 January 2009. Retrieved 10 June 2008. ^ Interagency Task Force on Commodity Markets (July 2008). "Interim Report on Crude Oil" (PDF). Washington DC. Archived from the original (PDF) on 11 December 2008. Retrieved 27 December 2008. ^ "Bodman: Insufficient oil production behind prices". International Herald Tribune. Retrieved 27 December 2008. ^ "Riyadh's crude output decision, wrong". Presstv.ir. Archived from the original on 23 June 2009. Retrieved 27 December 2008. ^ H. Josef Hebert (10 September 2008). "Study links oil prices to speculation". Associated Press. Archived from the original on 15 January 2017. Retrieved 16 December 2015. ^ Gas costs are reflected in nearly everything you buy, The Dallas Morning News, 15 June 2008. ^ Friedman, George (27 May 2008). "The geopolitics of $130 oil". Stratfor. Archived from the original on 29 May 2008. Retrieved 11 July 2008. ^ "Was Volatility in the Price of Oil a Cause of the 2008 Financial Crisis? - Resilience". www.energybulletin.net. Archived from the original on 30 April 2011. Retrieved 1 May 2018. ^ "High gasoline prices spawning songs, signs, symbolic acts". Associated Press. 13 May 2008. Retrieved 2 January 2016. ^ Reguly, Eric (12 April 2008). "How the cupboard went bare". The Globe and Mail. Archived from the original on 15 April 2008. ^ Ana Campoy (20 June 2008). "Prices Curtail U.S. Gasoline Use". Wall Street Journal. p. A4. Archived from the original on 1 May 2018. ^ Clifford Krauss (19 June 2008). "Driving Less, Americans Finally React to Sting of Gas Prices, a Study Says". New York Times. Archived from the original on 1 May 2018. ^ "The United States Inflation Rate By Year". Miseryindex.us. 24 February 2006. Retrieved 6 January 2012. ^ "OPEC Revenues Fact Sheet". U.S. Energy Information Administration. 31 March 2015. Archived from the original on 22 December 2015. Retrieved 16 December 2015. ^ Mouawad, Jad (6 December 2007). "OPEC Finds Price Range to Live With". The New York Times. Archived from the original on 5 June 2015. Retrieved 8 May 2008. ^ IEA warns of new oil supply crunch (Subscription Required). By Carola Hoyos, Ed Crooks, and Javier Blas. Financial Times. Published 12 November 2008. ^ a b Crude Oil Rises After OPEC Agrees to Trim Excess Production. By Margot Habiby and Alexander Kwiatkowski. Bloomberg L.P. Published 10 September 2008. ^ Well Prepared Archived 9 November 2008 at the Wayback Machine. The Economist. Published 6 November 2008. ^ OPEC Cut Has Little Zing. By Parmy Olson. Forbes.com Published 18 December 2008. ^ Dirk Lammers (6 May 2009). "Oil prices jump to high for the year". Yahoo! Finance. Archived from the original on 14 May 2009. Retrieved 7 May 2009. ^ Assis, Claudia; Lesova, Polya (23 February 2011). "Oil futures extend gains amid unrest". MarketWatch. Archived from the original on 21 April 2016. Retrieved 30 January 2016. ^ Krassnov, Clifford (3 November 2014). "U.S. Oil Prices Fall Below $80 a Barrel". The New York Times. Archived from the original on 16 December 2014. Retrieved 13 December 2014. ^ "OPEC Won't Cut Production to Stop Oil's Slump". Bloomberg News. 4 December 2015. Archived from the original on 28 March 2017. ^ "OPEC Basket Daily Archives". OPEC. Archived from the original on 21 January 2016. Retrieved 21 January 2016. ^ Kalantari, Hashem; Sergie, Mohammed (2 January 2016). "Iran Says Post-Sanctions Crude Output Boost Won't Hurt Prices". Bloomberg News. Archived from the original on 15 January 2016. Retrieved 16 January 2016. ^ "Home - Energy Explained, Your Guide To Understanding Energy - Energy Information Administration". www.eia.doe.gov. Archived from the original on 27 July 2008. Retrieved 1 May 2018. ^ "Development of a pea starch film with trigger biodegradation properties for agricultural applications". europa.eu. Archived from the original on 24 December 2013. Retrieved 1 May 2018. ^ Chua, H.; Yu, P. H. F.; Ma, C. K. (1999). "Accumulation of Biopolymers in Activated Sludge Biomass". Applied Biochemistry and Biotechnology. 78 (1–3): 389–400. doi:10.1385/ABAB:78:1-3:389. ^ "Demand" (PDF). Energy Information Administration. Archived (PDF) from the original on 3 January 2009. Retrieved 27 December 2008. ^ Barry James (12 September 2000). "Amid Protests, Europe's Leaders Resist Oil-Tax Cut". International Herald Tribune. Archived from the original on 22 August 2008. Retrieved 27 December 2008. ^ Paul Meller (3 June 2004). "EU states to avoid unilateral oil tax cuts". International Herald Tribune. Archived from the original on 11 June 2008. Retrieved 27 December 2008. ^ James Kanter (9 November 2007). "European politicians wrestle with high gasoline prices". International Herald Tribune. Archived from the original on 6 December 2008. Retrieved 27 December 2008. ^ Peter Alford (2 April 2008). "Japanese motorists reap fuel windfall". The Australian. Archived from the original on 22 June 2009. Retrieved 27 December 2008. ^ Tomas Havranek; Zuzana Irsova; Karel Janda (January 2012). "Demand for gasoline is more price-inelastic than commonly thought". Energy Economics. 34: 201–207. doi:10.1016/j.eneco.2011.09.003. ^ Lundberg, Jan. "The maturation of Matt Simmons, energy-industry investment banker and peak oil guru". energybulletin.net. Archived from the original on 11 April 2008. Retrieved 5 October 2011. ^ Matthews, H. Scott. "Telework Adoption and Energy Use in Building and Transport Sectors in the United States and Japan". Journal of Infrastructure Systems. Retrieved 15 July 2010.